Autism Interventions and Resources, Inc. (A.I.R., Inc.) is a group of professionals dedicated to providing behavioral services to children and adults with developmental disabilities. A.I.R. 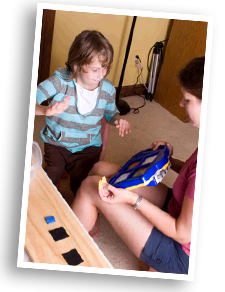 's services are based exclusively upon the science of Applied Behavior Analysis (ABA), the most-scientifically validated treatment for individuals with developmental disabilities. Each A.I.R. program is designed specifically to address the needs of an individual child, focusing on particular areas of strength while utilizing positive behavioral strategies to decrease maladaptive behaviors and improve areas of deficiency. Children diagnosed with a developmental disability including, but not limited to, Autism Spectrum Disorder (Autism, Asperger Syndrome, Pervasive Developmental Disorder Not Otherwise Specified, Rett Syndrome, Childhood Disintegrative Disorder), Down Syndrome, Mental Retardation, Fragile X Syndrome, Seizure Disorder, Cerebral Palsy, Attention Deficit Hyperactivity Disorder, and many others. Caregiver involvement is not only emphasized but is a mandatory component of A.I.R. programs. A.I.R. strongly believes that the child’s caregivers, in particular the child’s parents, are the most critical component of the child’s program. As such, parent training is provided to all caregivers directly involved in the child’s program. Caregivers will be trained within the child’s natural environment on how to apply behavioral interventions, generalize skills that the child is and has acquired, and structure the physical and programmatic environment to maximize the child’s potential. This includes teaching the caregivers to use only positive methods to make significant changes in the child’s behavior and skill level.